Kunde ha skickat den till många fler, men roligare att ge award åt specifika personer, man känner sig mer ärad om man får en award personligen, tycker jag. 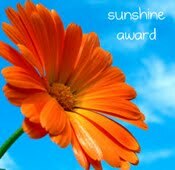 The sunshine Blog Award is awarded to bloggers whose positivity and creativity inspire other in the blogworld. 1. Put the logo on your blog or withhin your post. 2. Pass the award to 12 bloggers. 3. Link your nominees within your post. 4. Let them know they recieved this award by commenting their blog. 5. Share the love and link to the person from whom you recieved this reward.